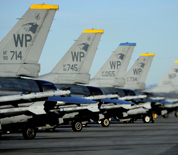 Situated 26 miles southeast of Fairbanks, Alaska is Eielson AFB. The host wing at the base is the 354th Fighter Wing, assigned to the Pacific Air Forces Eleventh Air Force. The wing is responsible for supporting field and air training exercises associated with Red Flag Alaska. The town called North Pole is located only 8 miles from Eielson. The surrounding area is ideal for hiking, fishing, canoeing, dog mushing, cross country skiing, snowmobiling and one of the best views of the Northern Lights. This Eielson AFB directory features the critical info you’ll need to navigate through the many facilities and recreational opportunities available on base.